Cellular network operators have invested billions of dollars in purchasing rights to use frequency spectrum around the world. This spectrum is necessary to deliver the high data bandwidth demanded by smartphone users to view emails, web pages and stream audio and video while mobile. In order to maintain a high level of network performance, operators need to continually monitor their spectrum to identify and locate sources of interference. Interference can come from illegal transmitters and from unintended sources such as intermodulation products. All will reduce the networks data capacity, which results in a reduced user experience. Operators can act quickly to protect their investment and maintain data capacity. The MS27103A remote spectrum monitor is designed to identify and locate interfering signals. This serves to optimize the user experience, a key goal for network operators. This translates into customer loyalty, reduced customer churn and superior brand. Additionally, DAS systems are being deployed extensively around the world to provide high data capacity in dense user environments. These include transport hubs, sports stadiums and shopping malls. From a single equipment room, multiple feeds pan out to a distributed array of antennas. Monitoring for interference signals on each of these RF feeds is essential to maintain capacity for the DAS system. The MS27103A is the perfect monitoring solution for DAS systems to help maintain overall system performance. The MS27103A is housed in a rack-mountable enclosure with 12 (or optionally) 24 RF Inputs. An electronic switch is used to address each port. The MS27103A is a full featured platform for monitoring and recording signals at user specified frequencies. 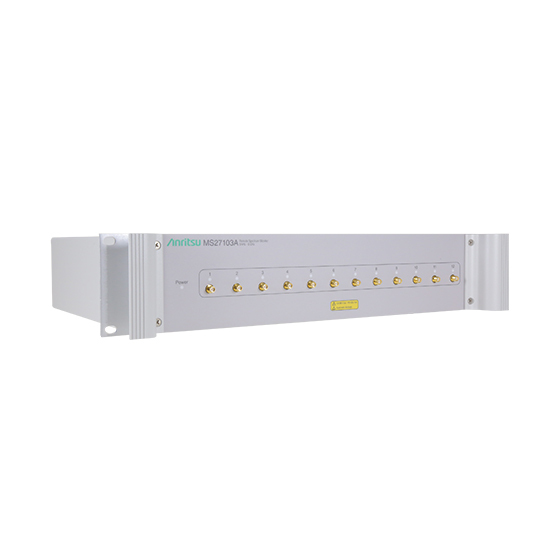 Capable of sweep rates up to 24 GHz/s, the MS27103A allows for the capture of many types of signals. This includes periodic or transient transmissions as well as short “bursty” signals. The 20 MHz instantaneous FFT bandwidth available on the MS27103A monitor provides the ability for wideband real-time captures of signal activity for subsequent post-processing. IQ captures can be recorded both in block mode or streamed. A “save on event” feature is also provided to capture spectrum measurements only when certain user-settable thresholds are violated. This saves memory space since only signals of interest are captured and recorded. Several ways of communicating with the MS27103A can be utilized. These methods are highlighted below. An integrated web server is embedded into the MS27102A. Using an internet browser (Chrome and FireFox are supported), a user from anywhere in the world can log in to the spectrum monitor and control any of its features. This includes such parameters as frequency setting, RBW/VBW control, reference level configuration and many other settings relevant to the user’s spectrum monitoring application. At the same time, trace data, spectrograms and other measurements can be viewed inside the browser window. A key advantage of the web server is that it is operating system platform agnostic. Any electronic device capable of rendering a browser will work with the web server. PCs/laptops, tablets or even smart phones can be used to view spectrum and adjust remote instrument settings. Each monitor also features Gbit Ethernet, allowing fast transfers of measurement data and control information. Users can also write their own monitoring program using available SCPI commands. Anritsu provides a user manual listing each SCPI command, a description of the commands and the correct syntax required for each command. Additionally, each individual pair of IQ data output by the monitors is time-stamped using high precision GPS signals. This enables the use of IQ data for Time Distance of Arrival (TDOA) applications for geo-locating signal positions. IQ data time stamp resolution is less than 9 nSec for precise signal location calculations. Vision™ software is also available as an option. Vision works with the monitoring hardware to automate the process of collecting measurement data, providing useful information about network heath and use of the spectrum. Vision is composed of two components responsible for monitoring and locating interference signals. Vision Monitor automatically records spectrum data, maintains a searchable spectrum history database, enables alarm functions for unusual signal activity, automatically sends email alerts and provides a set of tools for managing the spectrum monitoring system. Vision Locate provides the capability to geo-locate interference or illegal/unlicensed signals. To properly locate signal positions, three or more monitors must be used. More information about the Vision products can be reviewed on the Anritsu website. 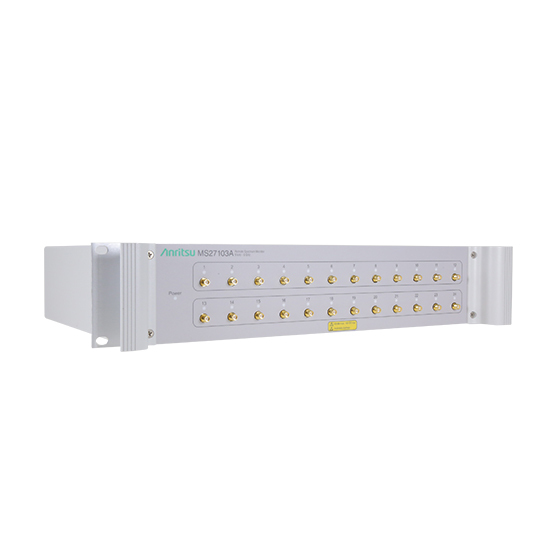 The MS27103A is a multi-port RF In monitoring platform employed in systems requiring multiple antennas to cover a large frequency range. This monitor is often used with cellular infrastructure equipment with multiple sectors and multiple frequencies per sector. Billions of dollars are typically spent by network operators on spectrum auction acquisitions. To protect that investment, it is imperative that cellular providers provide quality service to their customers. Interference from a variety of sources leads to dropped calls, slow data rates and poor network performance. The MS27103A can monitor receive signals at the BTS, facilitating the identification and removal of interference. Patterns of unwanted signal activity can also be examined, providing an efficient way to characterize and locate the source of the interference problem. Communication with the MS27103A is done using the GBit Ethernet port located on the instrument. Options are provided for using DHCP to obtain an IP address dynamically or for setting up a static IP address. The instrument is shipped with the default static IP address of 10.0.0.2. Once a connection is made to the instrument via a laptop/PC, the IP type can be changed via the user interface presented by the monitor’s integrated web server. For DHCP usage, Anritsu offers an Ethernet Discovery Program which queries your network for all connected devices. The Ethernet Discovery Program can be found on the Anritsu website. www.no-ip.com. You will need to create an account and select a hostname for your instrument. Further details about configuring your Ethernet connection can be found in our Configuration Quick Start Guide available for download in the Download Library tab.